Figure 1: Schematic of an ultrashort pulse with a pulse front tilt. The upper part arrives earlier than the lower part. Pulse front tilt is a phenomenon which is often encountered in ultrafast laser physics, particularly in the context of very broadband ultrashort pulses. Essentially it means that the arrival time of an ultrashort pulse varies across the beam profile (Figure 1). In other words, there is a tilt between the pulse front and a direction perpendicular to the beam. It can be shown  that a pulse front tilt is intimately related to angular dispersion, i.e., with a dependence of the wavefront orientation on the optical frequency. It is thus somewhat problematic to interpret pulse front tilt as an angle between the pulse front and the wavefront, because the wavefront orientation is frequency-dependent. Note that pulse front tilt can also result from simultaneous spatial and temporal chirp . Pulse front tilts can arise in various situations. 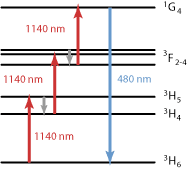 For example, there is a strong pulse front tilt when a laser beam with ultrashort pulses is spatially dispersed by a prism or a diffraction grating. A linear pulse compressor based on a prism pair or a pair of diffraction gratings, when well aligned, should in principle not cause angular dispersion or pulse front tilt outside its setup, but for broadband pulses, slight misalignment can change that. Even for perfect alignment, slight beam divergence inside the device can cause a pulse front tilt. Note also that the use of slightly wedged optical components is common, and these also introduce angular dispersion. For narrowband pulses, e.g. with pulse durations of multiple picoseconds, accidental pulse front tilt with a significant magnitude can hardly occur, but ultrabroadband sources e.g. for few-cycle laser pulses are rather sensitive to such effects. In some cases, a deliberately created pulse front chirp can be useful, e.g. in nonlinear frequency conversion, including the generation of terahertz or x-ray pulses. 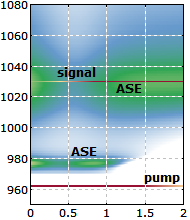 Many techniques for pulse characterization are not able to reveal pulse front tilts, which can then simulate a longer pulse duration e.g. in measurements with autocorrelators. There are, however, specially adapted autocorrelators for measuring pulse front tilt , and the GRENOUILLE technique can also be used .